Having Graduated from Bombay University in 1962, I worked in Mumbai for nearly 40 years in both Technical and Marketing field. I rose from a position of Quality Control Inspector and retired as Vice President (Sales) in Cello Thermoware Ltd. Mumbai. After retirement self and my wife are settled in Pondicherry. Right from the age of 20 years. I had the great passion for reading fictions by authors like James Hadley Chase, Erle Stanley Gardner, Alistair McLain, Wilbur Smith, Harold Robins, Jackie Collins, Leon Uris, Jeffrey Archer, Fredrick Forsyth, Robin Cook, Sidney Sheldon, James Patterson, Tom Clancy and many others. I always carried a book with me when travelling in train, bus, flight etc. Our 2 sons are settled in USA with their families. I am a keen observer of social events in India and in other countries. I have great interest in games like Cricket, Tennis, Badminton, Hockey, Table Tennis and field games. I keep myself occupied with walking, shopping, reading etc. What made you want to start putting your ideas on a paper? To actually write a novel? The liking for writing was with me for more than 10 years. But I had not taken it seriously. In the recent past various social injustices in India like corruption by the political class, and administrators, atrocities against children, rapes on women and even small children prodded me to write stories based on the actual events. At this advanced age, I cannot take any active action against such revolting atrocities in India. I thought I will write stories which will motivate young generation to take corrective actions. From the looks of things, you’ve recently released your first novel. Tell us about your book and why the readers should read it. 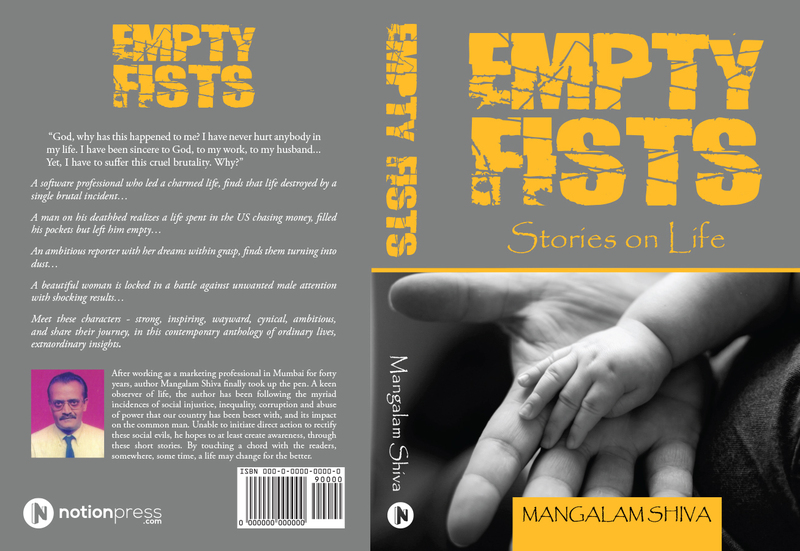 My book “EMPTY FISTS” is an anthology, with a collection of short stories. I got an innovative idea of expressing my thoughts through a stray dog “Raju” who saves some innocent children and some gullible adults from calamities. Raju is an intelligent animal unlike what we humans think about animals. This idea has been greatly admired and appreciated by all the readers. The other stories depict the travails of affected women who are ill treated by men. The women in India strongly feel that India is not at all a safe place for girls right from their birth till they die. The readers will be moved by these stories and learn some moral messages in my book. What were your inspirations for your novel? My inspiration for writing is my ideas emerging in my heart and mind. When I see or read the unpleasant events in India through TV media and newspapers, I feel for the affected persons which impel me to frame a story line. Based on my imagination and feelings, I create characters and situations in the stories. What were your goals and intentions for this book, and how well do you feel you’ve achieved them? The goals for my book were to highlight the evils in Indian Society through the characters and situations which will shake the readers to wake up and realize the facts in the country. All the readers of my book have felt the intensity of my ideas and have appreciated the sentiments conveyed by the stories. I consider these comments as great achievement of my book. What is your biggest learning experience while writing your novel? The biggest learning while writing the book was that human mind can be sharpened by focused thinking and expressing the thoughts through words. What is the hardest part in publishing your novel? The hardest part in publishing the book was copy editing. I did not want any mistakes in grammar, presentation or style of presentation. One reader in Goodreads, Valicity Garris has appreciated in her review that my book is free of any mistakes, which is a great asset for the book. What do you think is the future of reading & writing? The future of reading and writing is very bright. In spite of various diversions like TV channels, movies, cell phones, electronic gadgets and other entertainment modes, there are people who are keen on reading & writing. This can be witnessed by the increasing numbers of authors who come out with their presentations daily. More and more young people are motivated by their thoughts and revolutionary ideas. In my free time I like to read fictions by Tom Clancy, David Baldacci, James Patterson, Robin Cook, Robert Ludlum and many others. I am a first time author and will limit my advice to the aspiring authors to have conviction in their ideas, have tremendous level of patience and limit their anxieties post publication. I have already written more stories with different concepts. The manuscript for my 2nd book is ready and I hope to publish the same by New Year 2016. A big thank you to Mangalam Shiva for taking the time to answer our questions and to share his thoughts and passion for writing with the rest of the blogging community.